The Chiefs took the lead in the 46th minute as Mallory Williams buried her shot from inside the 6 yard box in the roof of the net. A penalty kick goal by Jessica Maerz senior Emmy Dale in the 73rd minute tied the game that went to PK’s ultimately. The Bulldogs continued their recent improvement. They took a 3-1 lead into halftime and got a final goal in the second half. Goals were scored by Katelyn Maddy, assist Kim Carter, Ellen Spooner from Ashley Kerr who also assisted on Olivia Cox’s first goal. Cox got a second, unassisted, in the second half. The Bulldogs move to 5-2 in the Ozark Conference and play West Plains tomorrow night (Friday). Michelle Esterle broke the deadlock in the 43rd minute, scoring from Mollie Plocher’s corner kick. 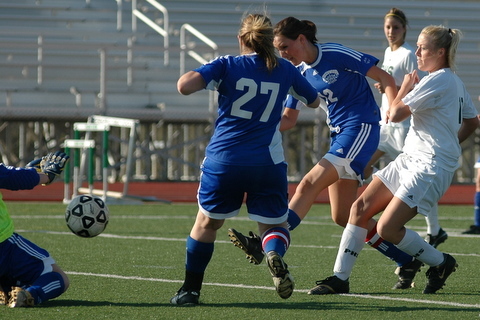 The Zizzer’s extended their lead in the 66th minute when Ashley Martin pounced on a loose ball off a corner kick. It earned the Zizzer’s their first Ozark Conference win this season. On a gorgeous evening, with 75 degree wind chills (had to write that!) the Vikings hosted their small school neighbors at JFK Stadium. Fresh from their tight battle with the Falcons the night before, Parkview came out with a chip on their shoulder and attacked the ball. It’s an approach the Jays are familiar with and they showed good discipline, slowly but certainly working the ball up to Caroline Jansen and Maddie Esther in the middle or Maria Allai on the right side. With a back line that all wear the captains armband (junior Maral Cavner, junior Liza Salisbury and #27), fronted by indefatigable sophomore stopper Maddie Smith, the Jays worked to take advantage of the wind in the first half. Parkview has a fairly potent strike force however and their aggressive play eventually led to a pair of goals in the first half. The ultimate game-winner was scored by sr. Emmy Dale who won a 50/50 battle for a cross in front of the six yard box, sending her shot to the corner past the keeper. The cross was delivered by sophomore Shelbie Stewart, who had earlier won a 50/50 ball herself and broke down the left side of the field before sending the ball into the center. The second goal was scored in stoppage time and this time it was sr Courtney Ash who found a way to get the final touch on the ball as the GK and two of her defenders collided attempting to clear. The second half saw the temperature and the fast surface have it’s effect on the Jays as they worked hard to keep up with the regular substitutions and wind aided through balls by the Vikings. They still found a way to get the ball forward and put some pressure on the Vikings keeper but the defense held firm. The Vikings got a final goal on a defensive breakdown as an attempted clearance on the right side was intercepted by Dale who’s shot from outside the box to the far side of the net was indefensible. 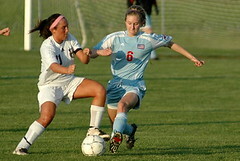 BTW, that’s freshman Kelsey Loderhose getting to the ball in the photo above, in front of Megan Morris. 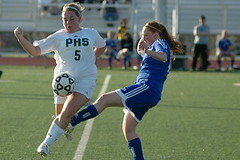 Shelby Hatz scored three goals and added an assist. Tara Bailes had a goal and two assists. Anna DeLong got the game winner in the 3rd minute. Natalie Smid also scored, the first of her high school career. This is the kind of break out game I’ve been expecting from Hatz since I saw her at the Rolla Classic in late March. A good omen for Catholic. Goals were scored by Erica Combs in the first half off of an assist by Orielle Thomas. Second Half goals were scored by Shanna Neeley and by Katie Pritchard from a Neeley corner kick. Hutchinson gets the shutout. The Tigers improved to 9-0 and 5-0 in Ozark Conference with the win over their local foe. They will play at Lebanon on Thursday. The Yellowjackets improved to 4-0 in the Conference with their win over Hillcrest tonight. The Yellowjackets got goals from six players. Michelle Lindesmith, Hanna Winkel (2), Brianna Ragains, Cassie Wood, Janel Glidden and Britney Hall, a senior defender – first career goal. The Falcons got past local rival Parkview tonight, as senior Jamie Bond scored a brace, Emily Cline continues her streak and Megan Garrad got the final goal. Jeni Frewin had a pair of assists. For the Vikings, goals were scored by Shelbie Stewart, Emmy Dale and Jessica Maerz. The Joplin Eagles got a goal from MSSU signee jr. Kelsey Sanders in the 42nd minute and held on for a 1-0 soccer victory over the Chiefs. 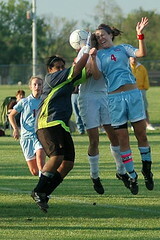 Joplin goalie Randi Russell, an MSSU signee, had 11 saves in picking up the shutout. Kickapoo outshot the Eagles 13-7.